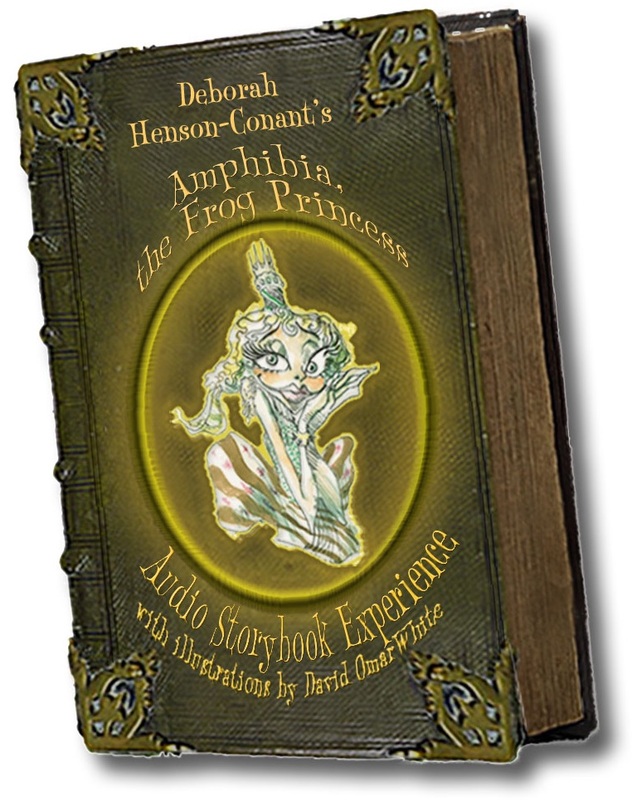 The Frog Princess is a CD, a narrated musical for singing actress and symphony … and we’re even working on a YouTube storybook using artist David Omar White’s beautiful drawings. It was premiered with the Buffalo Philharmonic with composer Deborah Henson-Conant as soloist, and it’s been featured at the Chicago Humanities Children’s Festival, the Kennedy Center and with orchestras like the Buffalo Phil and the Orlando Philharmonic. 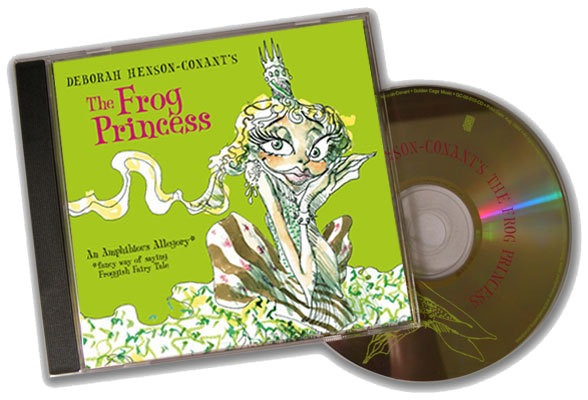 On disc, “The Frog Princess” is an hour-long CD that includes music and narrated story, all performed by the composer and story-writer Deborah Henson-Conant. 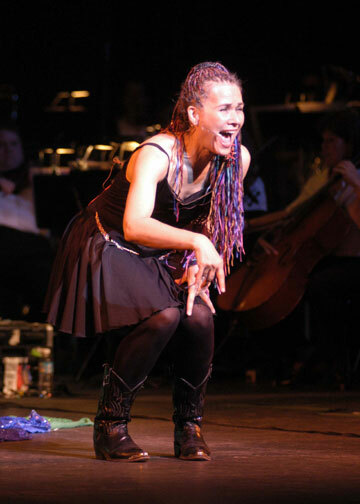 Live, “The Frog Princess” runs approximately 45 – 50 minutes when performed live. It can be performed with full orchestra, chamber orchestra or, in smaller theaters, with CD playback. 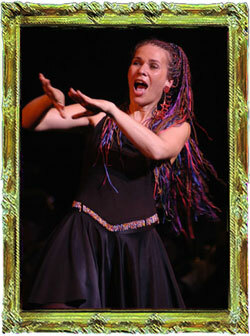 To find out about booking a performance, visit artist’s contact page. I was fortunate enough to be with all those excited children today at your concert at the Majestic in San Antonio. It was Magic!! Little children all around me were dancing in the aisles! What fun it was to be part of that concert! I noticed all the young fans gathered around you after the concert. They are the future of the arts. Thank you for giving them a glimpse of what a brilliant future that could be. I just want to thank you again for a magical afternoon of music, theater and dance! Bravo! Bravo!! Bravo!!! 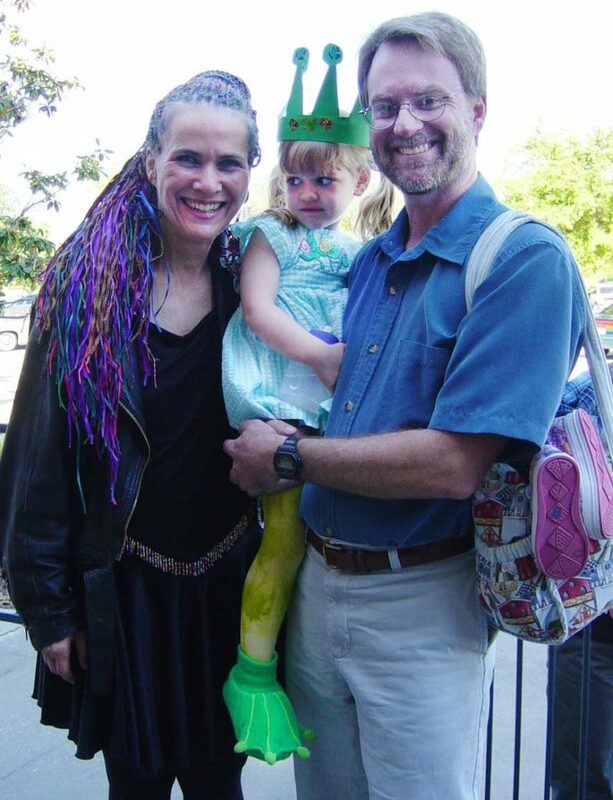 And below is one of the exceedingly well-dressed audience-members who came to the Family Show of “The Frog Princess” with the Orlando Philharmonic – together with her father and the composer! You can listen to the story, see the illustrations and even read and sing along with the author. 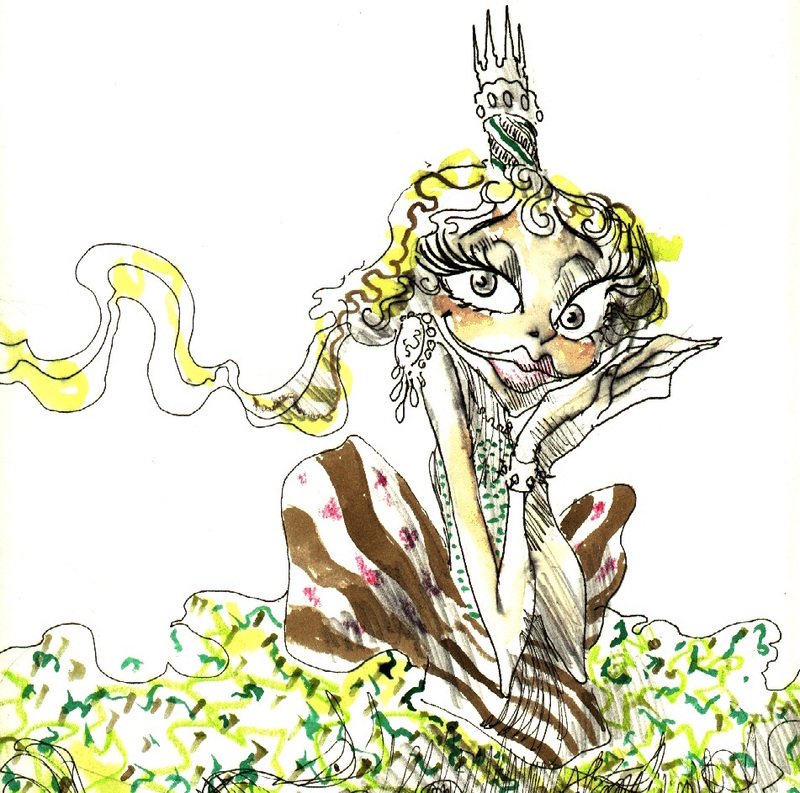 You can also look at the beautiful illustrations created by artist David Omar White for the original performance of this musical story in 2001 with the Buffalo Philharmonic and author Deborah Henson-Conant. Do they get married? What if they have kids? What would it be like if your father had once been a frog? Would you be afraid of turning into a frog, too? I wanted to know the answer to that question. That’s why I wrote “The Frog Princess” — because sometimes we have to write the stories we need to hear. And I wrote it as a musical, because music is how I explore ideas and emotions — and I love fusing music and stories. So, meet Amphibia, daughter of the Frog Prince. For years the Frog Prince has groomed his daughter to take over the Kingdom. Now he’s about to die, but Amphibia’s evil governess tells her that the moment she wears her father’s crown, she’ll turn into a frog — just like her father did. It doesn’t help that Amphibia’s only friends are the the wisecracking Fool – and the frogs in the pond. It doesn’t help that she thinks she LOOKS like a frog! And what about love? If her secret frog-self comes out, could anyone ever love her? “The Frog Princess” is about facing the fears of who we are inside. It’s about romance, desire, the power of both tears and laughter, and about overcoming the fear of humiliation as we discover … and reveal … who we really are. 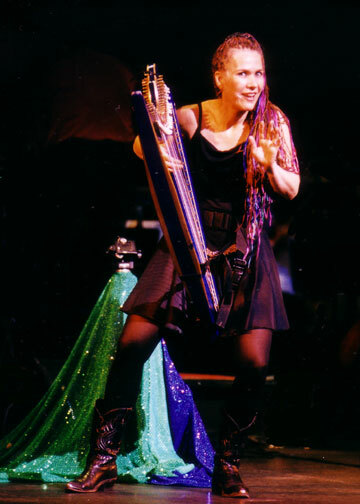 “I’ve always loved to hear one person tell a story, embodying each character — and I’ve always loved writing and performing musicals, so I created “The Frog Princess” as a one-person musical, so I could tell the story on stage, be all the characters and sing all the songs. It’s like I get to be a whole story, myself. Once upon a time there was a princess who thought she was a frog. She didn’t look like a frog. She was just convinced that, deep down inside, she really was one. Those lines felt emotional and personal to me. I knew how that girl felt, and I wanted to know her story. One of the ways I understand things in life is to create stories about them — to discover the meaning through the story I create. By the end of that workshop, I performed a completed version of the story, but like many stories I write, the emotional sense comes first and it takes awhile for the plot to gel. So I put the story into a drawer. But the first three lines continued to haunt me. I knew this was a story I needed to tell — I just didn’t know how I’d do it yet. A few years after that I started working as a soloist with orchestras, and composing the music I played with them. When the Buffalo Philharmonic invited me to perform a Family Show, I knew it had to be “The Frog Princess.” I finished the story and composed a version for symphony orchestra, kind of like “Peter and the Wolf” meets “Fractured Fairy Tales.” Then I asked ask artist David Omar White to make a series of drawings to go with the story, and I recorded a CD, performing all the characters and singing the songs. “The Frog Princess” is the story of a young girl’s coming-of-age, her love for her father and her story of overcoming her fears, finding her own power, learning courage and finding true love. Sometimes I think it’s my own autobiography. I’m still learning to embrace my inner frog.